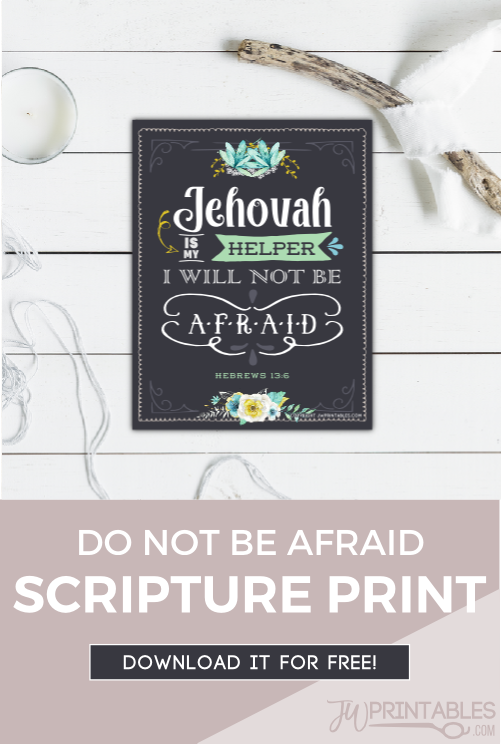 Jehovah Is My Helper – Free Print! There have been so many natural disasters, earthquakes and other events that have recently impacted our brothers and sisters around the world. Our family has been praying for our spiritual family, especially those going through serious trials and tests of faith at this time. If we could reach out to hug, comfort or help every single brother or sister we would, but it’s such a comfort to know that we are able to help provide aide through our support of the organization and it’s relief work and also through our prayers. Today’s printable is something that can serve as nice reminder that no matter what happens, Jehovah is always with his people. It can be framed or used as an smartphone or tablet wallpaper. To use this print, simply download it using the button below. For the sturdiest results, print onto at least 80lb cardstock from a typical inkjet printer. It will fit perfectly inside of an 11 inch by 8.5 inch photo frame. It will work well in any room in the house. OPTIONAL: If you’d the image sizing to be larger, you have our permission to take this file to a printer near you and they’ll blow it up to a larger size. We Shall Serve Jehovah – Free Print! Thanks so much for this website. You all doing tremendous job. We love your website. Especially my 2 daughters. Always in meeting or preaching they using your website note book for kids. When brothers sisters ask where you get. They show back of page here tell them it’s free you can download too or we can give you. May jehovah bless you. Leah Holmes, Southgate congregation, Michigan, USA.